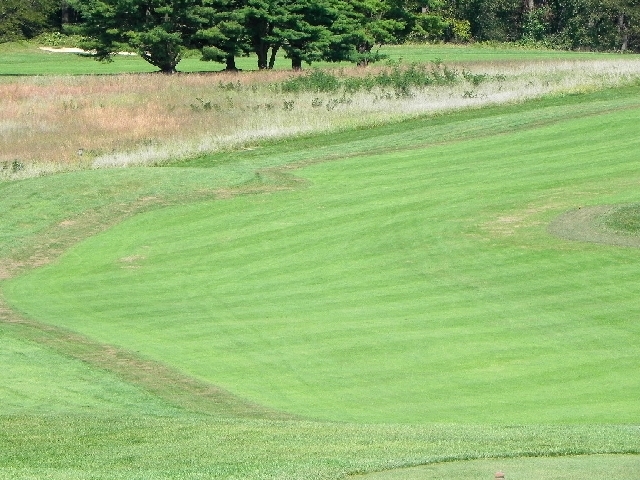 The picture below is of the approach area on #6. On the left is a patch of bentgrass sod next to the dead perennial ryegrass intermediate rough. Above the dead area is the vibrant ryegrass intermediate rough aside the bentgrass approach. Why did the intermediate die in the bottom part of the photo and not above along the approach? We will answer this question through the pictures in this posting. The picture above is terrific as it illustrates the difference between older varieties of turf and scientifically enhaced turf. 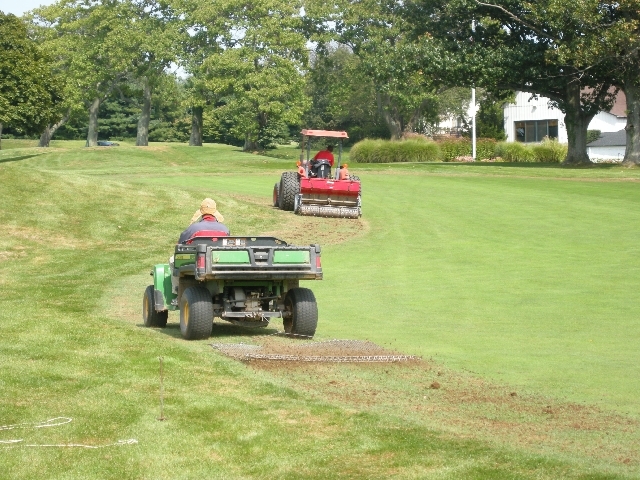 We sodded the intermediate roughs surrounding the greens in the fall of 2010. 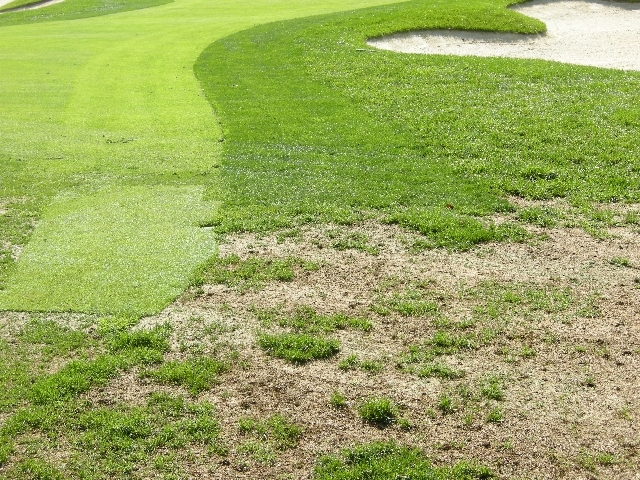 The type of perennial ryegrass usedwas impregnated with an endophyte to ward off turf diseases such as Grey Leaf Spot (GLS). 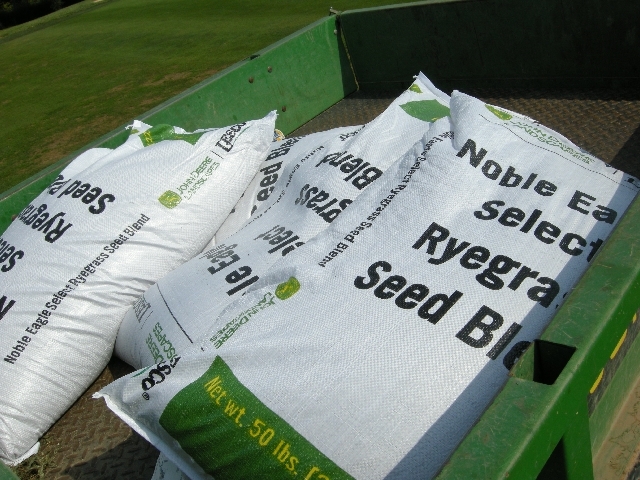 Below is picture of the seed blend we have used this fall to seed areas of the intermediate roughs that were lost to GLS. This is the same exact blend used in our greens intermediates. 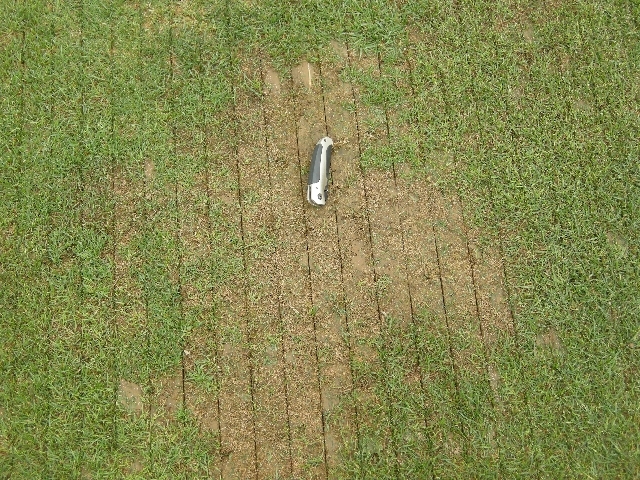 Our process for seeding was first to aerify the intermediate rough. Below is Seasonal Employee, Nick Buoni, working on the first hole. 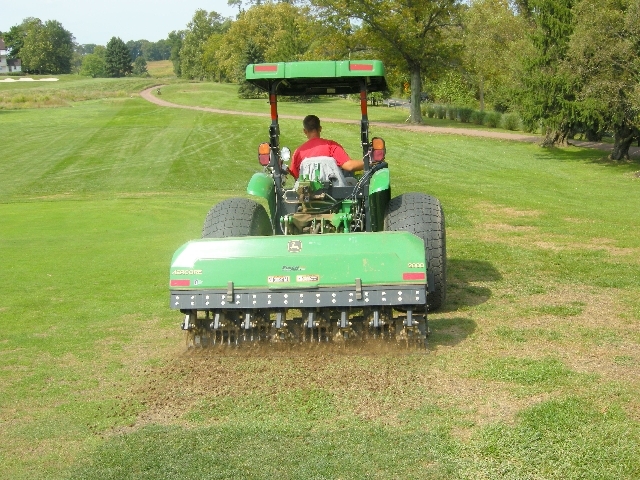 Then, we would use an implement called the “Seed-A-Vator” to punch and drop seed into the aerified areas. 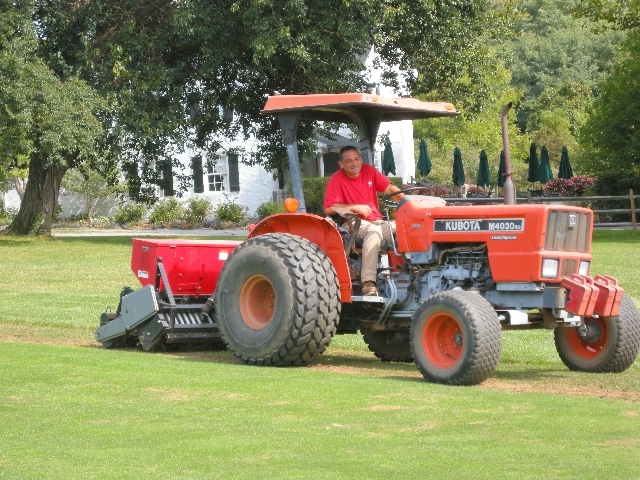 Pictured below is Steve Oratorio operating the Kabuta tractor. Next, we would then drag the seed to ensure sufficient seed/ soil contact. The picture below was taken on September 21st during our official USGA visit with Darin Bevard. It shows most of the intermediate rough in need of over-seeding, as well as, the fairway area near the bunkers at the turn of the dog-leg. The next pitcure was taken Friday, October 5th, two weeks after our initial seeding. Most of the intermediate has taken the fairway is beginning to heal-in. During the time we were seeding our intermediates, we were also seeding our fairways that we affected by the Grey Leaf Spot. 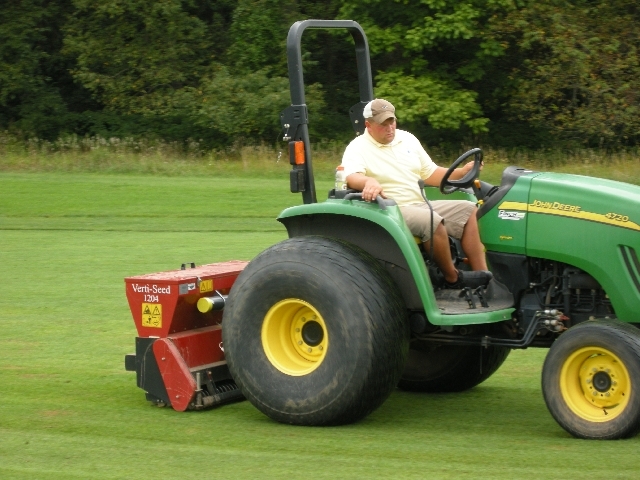 Below is Assistant Superintendent, Dave Smith, slice-seeding bentgrass into #6 fairway. This picture shows the pattern of slice and once the first direction is completed, we then slice-seed another direction for optimal seed distribution. 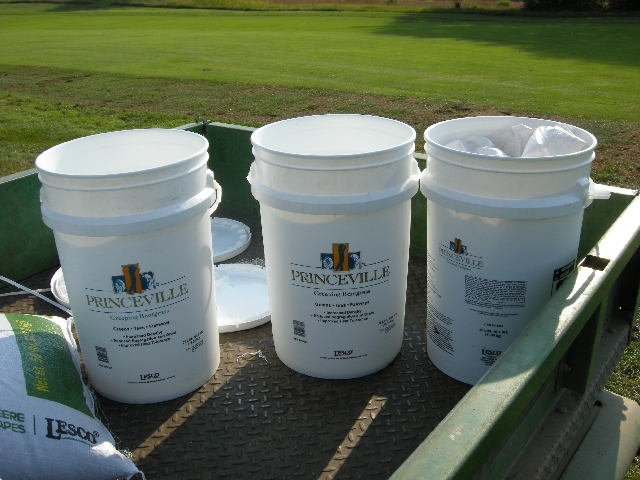 The bentgrass seed we have used in the past is called Princeville. It is noted for its quick germination and nice limey color togive you a contrast from the fairway to the perennial ryegrass intermediaterough to the tall fescue short cut roughs. 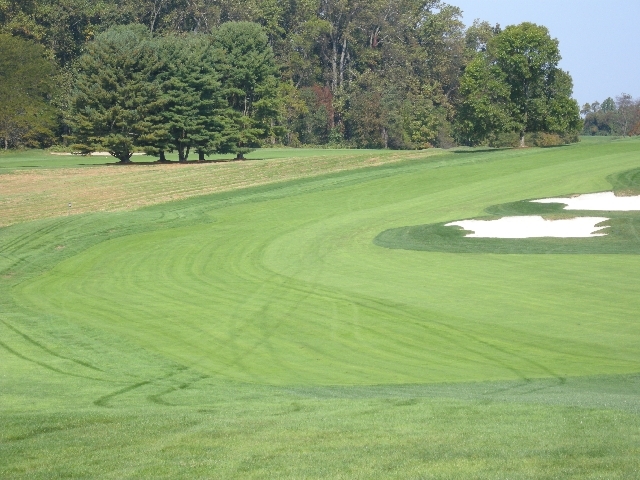 Princeville is in play on a number of courses in the area such as Philadelphia Country Club and was the initial cultivar used at Fieldstone Golf Club when it was built. 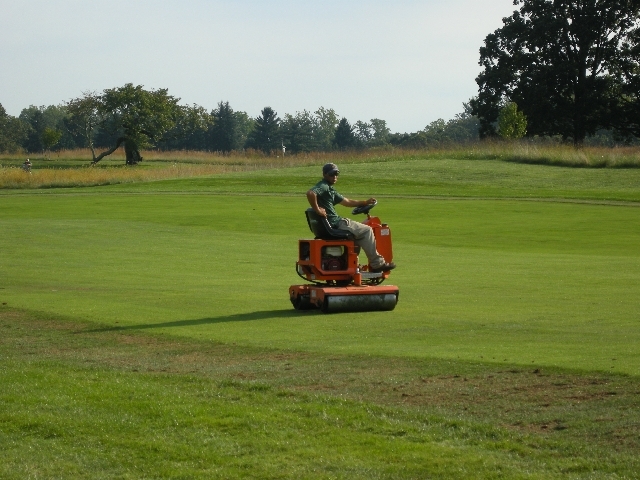 After slicing the fairway, we then use our greens roller to allow sufficient seed/ soil contact. Below is Jeff Tunnel, Spray Tech, working on the 10th hole. The picture below is very representative of our fairways. The voids are where perennial ryegrass was living prior to the infestation of Grey Leaf Spot. 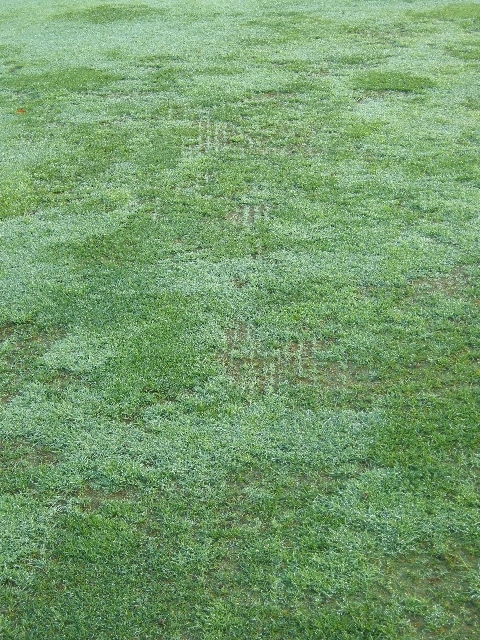 The darker green areas is Poa Annua. The lighter green areas is bentgrass. In the top-middle of the picture and middle-bottom, you can rows of bentgrass seedlings slowlyhealing-in on the 13th fairway. In time, we will have betterstand of turf with more bentgrass in the fairways and a stronger ryegrass to ward of diseases in our intermediate roughs.